Reap: Choose a house. Reveal the top card of your deck. If it is of that house, archive it and gain 1 . Otherwise, discard it. 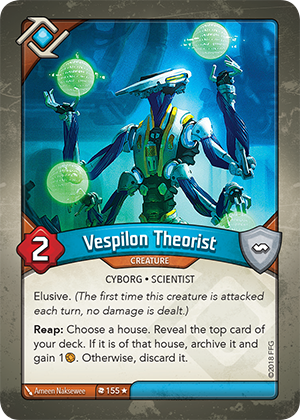 If I reap with Vespilon Theorist and do not have any cards left in my deck, what happens? First, you gain the standard 1 Æmber for reaping, However, you can only shuffle your discard pile to reset your deck when you need to draw a card, not when you reveal a card. Therefore, if your deck is empty, a card cannot be revealed and the remainder of the “Reap:” ability does not resolve.